Sprint, in a move that shows its increasing concern about the competition, has announced that it will give any T-Mobile customer a minimum of $200 towards a new device when they trade in a working device and port over their number. This offer will be available until April 9th, and customers can combine it with Sprint's existing contract buyout deal, where T-Mobile customers get $350 per line in the form of a Visa prepaid card to cover their first bill or early termination fees. Sprint and T-Mobile are competing for the third place position among the top four US carriers. Sprint, which currently holds the title (albeit barely), is watching T-Mobile's growth in the area and trying to guard its flank. After all, without costly network improvements, there's no point for the company to even think about becoming number two. Sprint's unlimited plan, priced at $60, comes in at $20 less than T-Mobile's. The carrier has broader coverage, but its data speeds tend to be slower. If you're tempted to switch, here's where you should go. The offer, available through April 9, also can be combined with a contract buyout offer, where eligible T-Mobile customers can get up to $350 per line via a prepaid or reward card to cover their installment billing balance on their current device or early termination fees after online registration. Sprint continues to offer the best value in wireless for individuals with unlimited high-speed data, talk and text while on the Sprint network versus T-Mobile’s unlimited high-speed data plan. Check it out! Sprint unlimited individual line plans start as low as $50 per month for other select devices. Comparison does not include device purchase at end of lease, taxes or surcharges. Compared to T-Mobile’s $80 Simple Choice Plan with unlimited high-speed data and includes unlimited international text and data features and Rhapsody unRadio. Sprint also announced today that Compass Intelligence, a market analytics and consulting firm, recognized the carrier’s phone buyback and trade-in program as the best among all major U.S. carriers for the fourth straight year. 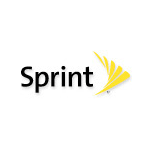 Compass Intelligence, which recently announced the recipients of its 2015 Compass Intelligence Awards, acknowledged Sprint’s commitment to reclaiming devices and the convenience of its trade-in program being available online or in Sprint stores. Last year, Sprint put more than $250 million back in customers’ pockets with its trade-in program, Sprint Buyback. 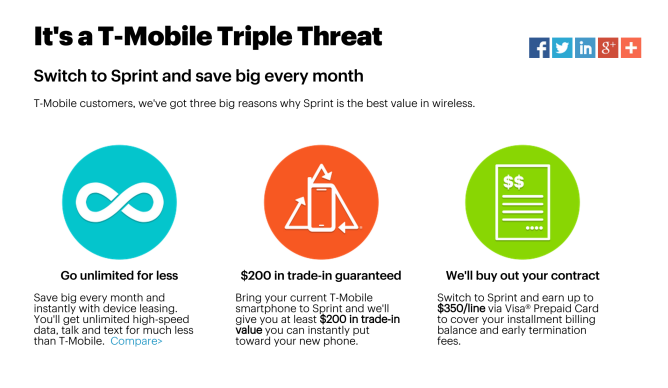 Sprint trade-in values are better than competitors’ programs in many ways, such as providing an instant in-store credit that can be used toward a new phone purchase, accessories or as an account credit. 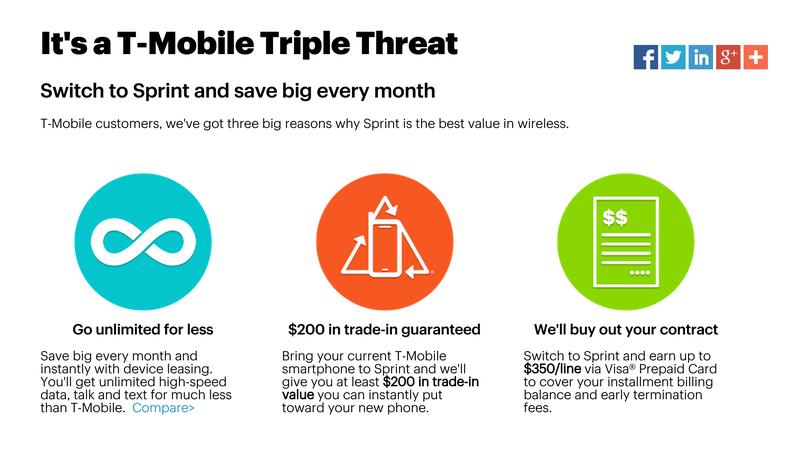 Sprint also allows customers to trade in up to three phones per line at any time and five in a calendar year. T-Mobile only allows one phone trade-in per line, and that transaction must happen when customers are purchasing a new device. In 2014, Sprint bought back more than 3 million phones. Of those phones collected, more than 80 percent were remanufactured as certified pre-owned devices. To date, Sprint’s phone trade-in programs have helped create more than $1 billion in cost avoidance for the company by reusing most of the devices they collect. Furthermore, Sprint’s relationship with Brightstar Corp., the world’s largest specialized wireless distributor, has helped it dominate the phone trade-in and pre-owned phone market. Sprint and Brightstar Corp. are subsidiaries of SoftBank Corp. In 2001, Sprint developed the first phone take-back program and in early 2010 was the first to take back other carriers' devices and provide an instant in-store credit. In addition to having the best buyback program, Sprint shattered the Guinness World Record for the number of cell phones recycled in a single week back in 2013, more than double the previous record set by AT&T.